APPSC AEE Notification 2018 Application Form Online: Andhra Pradesh Public Service Commission (APPSC) rolled out the recruitment notification for 309 Assistant Executive Engineer (AEE) posts for various engineering departments in the state. 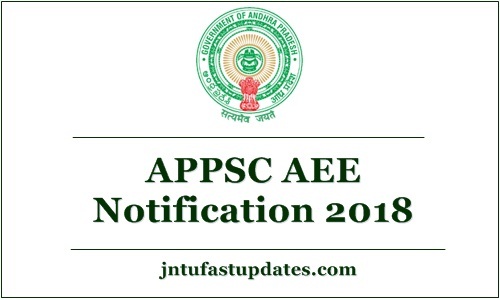 APPSC AEE Notification 2018 -19 has released on 30th November. The APPSC is releasing the AEE notification with a huge gap of 3 years. So, this time a large number of applicants are expected to apply for AEE posts this year. The AP AEE Recruitment 2018 holds a majority of civil engineering posts and also there are some other specialization posts were also mentioned in the notification. Aspirants dreaming to get the state government jobs in Andhra Pradesh can apply for APPSC AEE Posts 2018 from December to January. The online applications will be accepted from eligible aspirants at APPSC official portal, psc.ap.gov.in. Aspirants can refer the official notification from the same before applying for AEE posts. More details regarding Andhra Pradesh AEE notification 2018 are listed in this article. Applications are invited online for recruitment to the post of Assistant Executive Engineers in various Engineering Services for a total of 309 vacancies in the scale of pay of Rs.37,100 – 91,450 from candidates within the age group of 18 – 42 years as on 01.07.2018. The Commission conducts Screening test in offline mode in case applicants exceed 25,000 in number as per G.O.Ms.No.150, Finance (HR-I, Plg & Policy) Dept., dated:08.08.2016 and likely to be held on 17/02/2019. The main examination in online mode for candidates selected in screening test will be held through computer based test on 01/04/2019 FN & AN, 02/04/2019 FN & AN. There would be objective type questions which are to be answered on computer system. Instructions regarding computer based recruitment test are attached as Annexure – III. In case any paper of the Examination is held in different languages, the candidate has to choose the medium in which he/she wants to write the examination and the paper will be valued with reference to that medium only. Andhra Pradesh Public Service Commission (APPSC) is the state government organization that exclusively works to process the recruitments in various state-government organizations. APPSC releases various notifications based on the requirement recruits the suitable candidates in the announced jobs by testing their skills. This year, the APPSC released a job notification for 309 Assistant Executive Engineer (AEE) posts for vacant positions in various departments. Aspirants having the suitable eligibility criteria, educational standards can apply for APPSC AEE posts 2018 through online at psc.ap.gov.in. Check the details of eligibility criteria, application process, important dates, selection process, and other details from this article. Roads & Buildings Engg. Service. Must possess a Bachelors Degree in Electrical Engineering of a University in India established or incorporated by under a Central Act, Provincial Act or a State Act or an Institution Recognized by the University Grants Commission or an Equivalent qualification or a Pass in Section (A) and (B) of the Institution of Engineers in Electrical Engineering. As per G.O.Ms.No.103 TR, R & B (Ser-II) Dept., dated:22.05.1996. A.P. Water Resources Department. Must possess a Bachelor’s Degree in Civil Engineering of a University in India established or incorporated by or under a Central Act, Provincial Act or a State Act or an Institution Recognized by the University Grants Commission / All India Council for Technical Education or an Equivalent qualification. (As per AP Irrigation Engineering Service vide G.O.Ms.No.32, I & CAD Ser.IX Dept., dated:12.04.2010. A.P. Water Resources Department. Must possess a Bachelor’s Degree in Mechanical Engineering of a University in India established or incorporated by or under a Central Act, Provincial Act or a State Act or an Institution Recognized by the University Grants Commission / All India Council for Technical Education or an Equivalent qualification. (As per AP Irrigation Engineering Service vide G.O.Ms.No.32, I & CAD Ser.IX Dept., dated:12.04.2010. 07 Assistant Executive Engineers (Civil / Mech) in A.P Tribal Welfare Engineering Department. Must be a Graduate in Engineering (Civil / Mechanical) from any University in India established or incorporated by or under a Central Act, Provincial Act or a State Act or an Institution Recognized by the University Grants Commission or an Equivalent qualification. As per G.O.Ms.No.67, SW (V) dept., dated:12.04.1994. A.P Public Health & Municipal Engineering Department. Must possess a Bachelor’s Degree in Civil Engineering of a University in India established or incorporated by or under a Central Act, State Act or an Institution Recognized by the University Grants Commission / AICTE or a Pass in Sections ‘A’ and ‘B’ of AMIE (India) Examination in Civil Engineering. As per G.O.Ms.No.327, MA &UD (C) dept., dated:27.08.2012. No person shall be eligible for direct recruitment if he/she is less than 18 years of age and if he / she is more than 42 years of age as on 01/07/2018. There will be reservations in direct recruitment in respect of Scheduled Tribes, Scheduled Castes, Backward Classes, Physically Challenged, Women and Meritorious Sports Person as per Rule 22 and 22 (A) of A.P. State and Subordinate Service Rules. ii) Families having Household Supply White Card issued by Civil Supplies Department, A.P. Government. (Residents of Andhra Pradesh). Candidates will be shortlisted through various rounds. To get shortlisted for the AEE posts, candidates have to qualify the following tests. i need some help. i will lose my phone number and i forgot my password.. i will have only my id number. so how to change my phone number and get my password..
hi.. i am diploma student..diploma certificates are required to apply for appscAEE isn't? Civil department 2019 GATE Examination Feb 10 Only,pls change the date of AEE Prelims examination date. I am studying civil final year B.Tech in civil engineering ,shall i apply for this job. Im studying finial year B.Tech in computer science engineering. shall i apply for this job.